Make low-fat and sugar-free banana breads that pack in the flavor. Banana bread is painlessly transformed into a low-fat and sugar-free bread that packs a nutritional punch. With a few adjustments this simple, quick bread can boast all the flavor and texture of a full-fat version, while cutting back on oil and other high-fat ingredients. This easy-to-make bread works as a quick breakfast on the go or an energy-boosting midday snack and is a good way to put those old, darkened bananas to use. Much of the fat from oil can be easily eliminated from banana bread by using applesauce or low-fat yogurt as a substitute for much of the butter or oil called for in a recipe. But this is not an equal substitution, so it is best to use a recipe specially designed for using these substitutions. 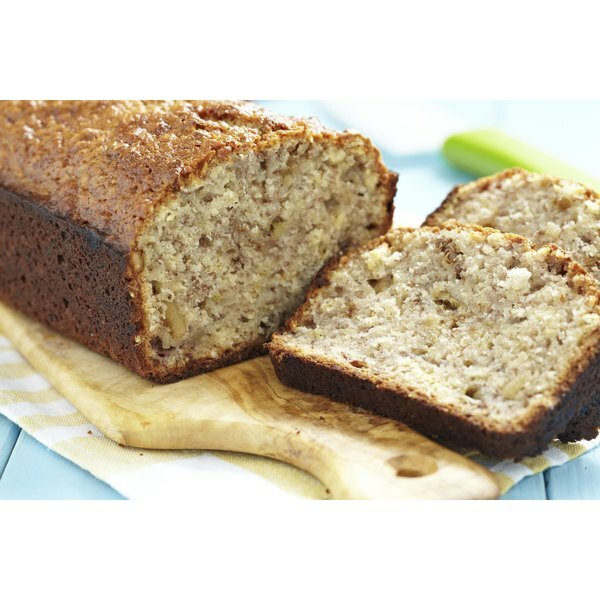 Both applesauce and yogurt allow for a textured banana bread with a light crumb without overpowering the delicate flavor of the bananas. The bananas in banana bread can carry the sweetness of bread with the addition of a sugar substitutes. Dates are sometimes used as a sweetener and substitution for sugar in cooking and can be used when making banana bread to do the same. Soak pitted dates in water for about four hours before making the bread and then puree them together with the bananas before you add them. This too is not an equal substitution, making it necessary to follow a sugar-free recipe for the best results. Note also that dates may not drastically reduce calories or carbohydrates, but do remove the refined sugar from the recipe. Alternatively, you can use a sugar substitute with a standard banana bread recipe to create an artificially sweetened, but sugar-free result. To make the sweetest and best-tasting banana bread, you have to start with the best bananas. This is where those overripe, browned bananas that you may otherwise throw away come into play. Save these browned bananas either in their skins or peeled by throwing them in a freezer-safe bag and freezing them until you have enough to make a loaf of banana bread. Using ripe bananas ensures they will impart plenty of sweetness and banana flavor in your bread. Walnuts will slightly increase the fat content of your banana bread, but assist in giving the bread its distinctive flavor. Lightly top the bread with walnut pieces to cut down on the quantity of nuts, while still producing a great-tasting bread. Be sure to only mix the batter until the flour is incorporated to produce a light, well-risen bread. Over-mixing may cause the bread to be too dense. Use a dark-colored bread pan to cook your bread evenly. Before pouring the batter, grease the pan and dust it with flour to ensure the banana bread does not stick to the pan. How Long Should I Cook a Cake If I Want It Super Moist?